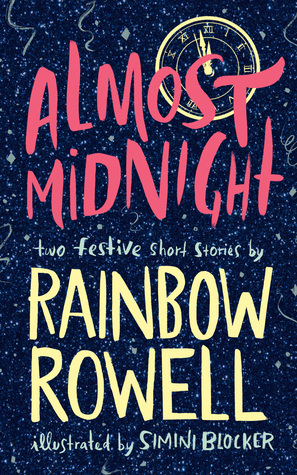 A lighthearted young adult short story collection, Rainbow Rowell’s Almost Midnight is guaranteed to bring a smile on readers’ faces. Midnights follows the every growing connection between two teens through their multiple New Year celebration experiences, while Kindred Spirits explores the variety of those in the “nerd” Star Wars Fans community by diving into the lives of two very different yet very similar teens. A beautiful collection of uplifting short stories presented through Rowell’s exemplary writing skills and Blocker’s lovable illustrations, readers can’t go wrong with reading Almost Midnight. A number of you have recommended Rainbow Rowell’s books to me over the past year! So I FINALLY bought Almost Midnight to get a taste of Rowell’s writing style and storytelling method; it’s a VERY short novel, which is perfect for testing the waters. My verdict? I LOVED IT! Rowell’s collection of two short stories was so well done! Short stories are rather difficult to execute properly, if you can believe it. But Rowell just drew me into her world with her adorable cast of characters and smoothly flowing stories. Friends…I think I found a new author to fall for. If you are a lover of short stories, Almost Midnight should DEFINITELY be on your TBR list! As someone who focused a large portion of her English Literature degree diving into the elements of an excellent short story, it’s hard for me to NOT be picky … thank gosh for Rowell’s impeccable writing skills! The story progression for both Midnights and Kindred Spirits are wonderfully done; the time jumps in Midnights eliminates any “this is progressing too quickly” feelings, as does the leisurely nature in Kindred Spirits. What I’m trying to say is…NO INSTA-LOVE or INSTA-ANYTHING! Seriously, Rowell removes this BRILLIANTLY! Her construction of the different plots and the pacing in these two short stories is carefully done, making you feel as though you’re receiving a full novel worth of content, not two short stories. Even though Midnights and Kindred Spirits are short stories, Rowell was still able to produce a beautiful amount of character development and diversity! The main characters in both stories have SO MUCH depth to them — the struggles they face with friends and family, the desire to know who they are and where they fit in this big thing called life — it’s truly remarkable how much Rowell is able to dive into. But it’s not just their back stories … the personalities all these different characters are well rounded and complex, making them all feel unique in their own way. The diversity among the characters also made this a joy to read — from ethnicity to physique, Rowell doesn’t miss a beat. Blocker’s illustrations are a great addition to Almost Midnight. Short stories with illustrations are ALWAYS a bonus, but Simini’s drawings wonderfully mimic the lovable vibe that Midnight and Kindred Spirits give off. And honestly, reading the cute moments and then getting a flippin’ adorable picture afterwards is always a a good thing! At the end of the day, Almost Midnight served its purpose — to bring laughter and joy to readers by writing a heartwarming story about love, friendship, and belonging. Midnight and Kindred Spirits are encompassed with a variety of grand elements that truly make this collection remarkable: the plots have depth but aren’t overbearing; the characters are well rounded and diverse; the pacing works perfectly for the time frame given in each story; the added illustrations are the perfect way to add more love into these stories. The short stories perform their intended goals — providing readers that “warm” feeling when something is truly just beautiful in every which way. Midnights and Kindred Spirits in Almost Midnight are both lovely short stories that are sure to bring a smile on your face. The characters are relatable, the stories are adorable, and the bits of humour throughout the plots make this such an enjoyable read. My ONLY complaint is that I wanted more after reading both stories — I LOVE THE CHARACTERS SO MUCH! However, these ARE short stories — which is why I ended up rating this 5 cups of tea. For those in reading slumps, those looking for a lighter read, or those who just want to make sure they’re next read is fantastic — I highly recommend you give Rowell’s Almost Midnight a chance. Fantastic review! I need to see if this is at my library. Well, if DATA approves, I’m in. Right?!?! DATA most definitely approves! I truly hope you enjoy it – it’s such a lovely collection! See?! More of a reason to give it a go 😉 I know — bad influence over here lol! It was so goooooood! I wish I discovered this author sooner! I’ve heard of Rowell, but I’ve never read any of her literature before … definitely changing that this year! Rainbow Rowell is hit or miss for me but this seems so creative and different. I’ll certainly have to check this one out! Hmmm, good to know! I haven’t read any other books by Rowell before, but I want to give another one a go — but it’s always good to know when authors have hits and misses. I hope you enjoy it! The stories are super cute!